How to get there: The trailhead is located on Hwy. 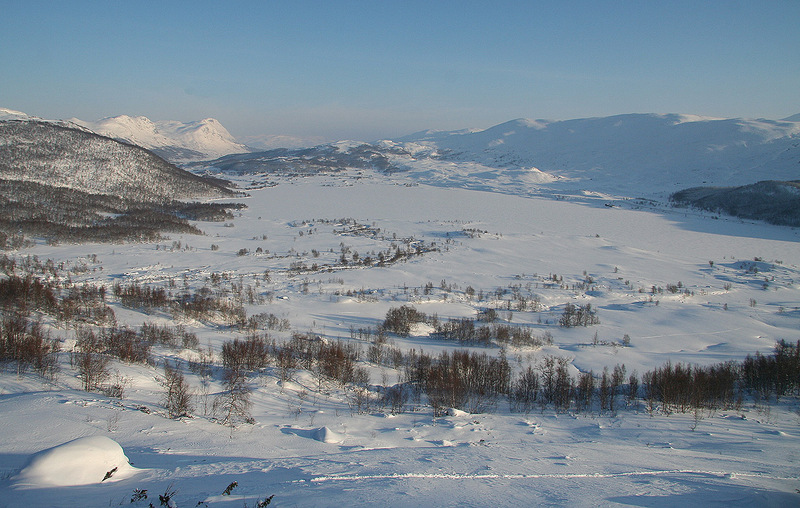 E-16 on Filefjell, about 12 kilometer from Tyinkrysset (on the west side). More precisely, the trailhead is next to Buhaugane, just where a small road (summer only) forks west, crossing a bridge over the short river connecting Øvre and Nedre Smeddalsvatnet. In winter, the parking is about 100 meter further south, this location is N61:09.785, E008:01.195, elevation about 936 meter. Route description: Cross the bridge and continue to the first cabin. 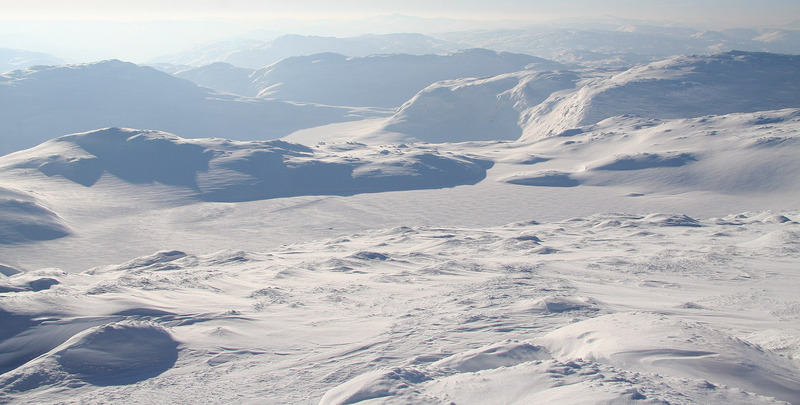 From here, find a line that ascends the left (south) slope of vetleFrostdalen such that you approach the center part of the valley approximately where you initially have a local horizon. As you get into the more level area (around point 1134 m), cross the creek and continue up the valley along its right hand side. You will get Frostdalsnosi (1536 m) up on your right and there are two summits marked at 1495 meter, more in front (slightly right). 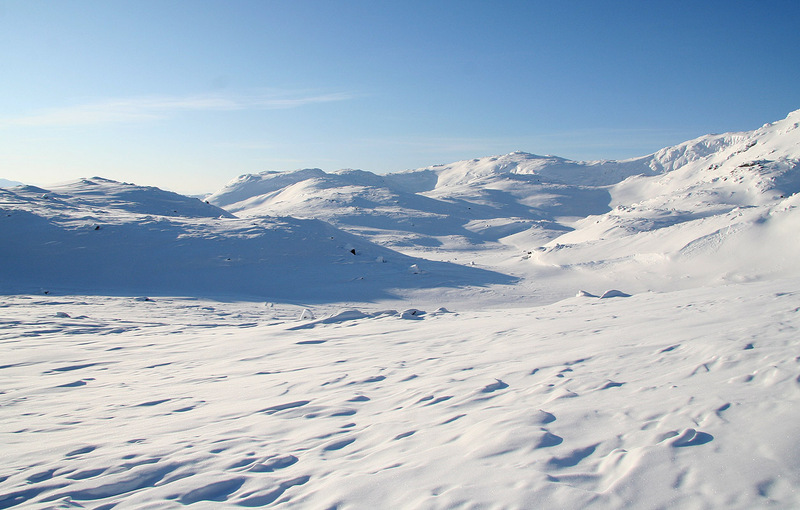 From an elevation of about 1260 meter, start a gradual ascent out of vetleFrostdalen, your goal is to cross between the two 1495 points. As you reach more level ground at 1400 meter, turn more left (west) and gain the broad col just north of point 1495 (the west point). 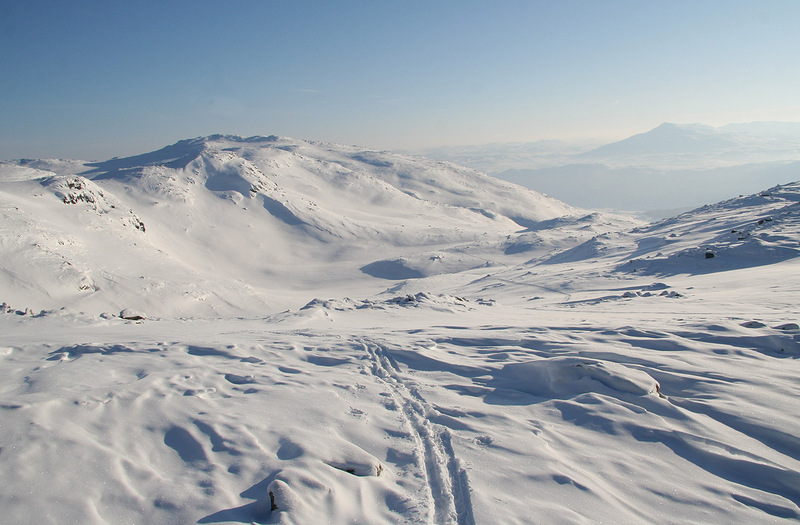 The terrain falls off on your left (west) side and you have the small mountain (point 1656 meter) right ahead. Ascend gradually north-west in order to gain the saddle between point 1656 and point 1576, the terrain is quite easy here. Proceed to climb higher on the north side of point 1656 and traverse onto the broad saddle between point 1656 and Berdalseken. A distinct valley comes up from the north side and there is a short passage around 1600 meter that is a bit steeper than what one can read from the map. It pays to climb higher if this short traverse should pose any problems. 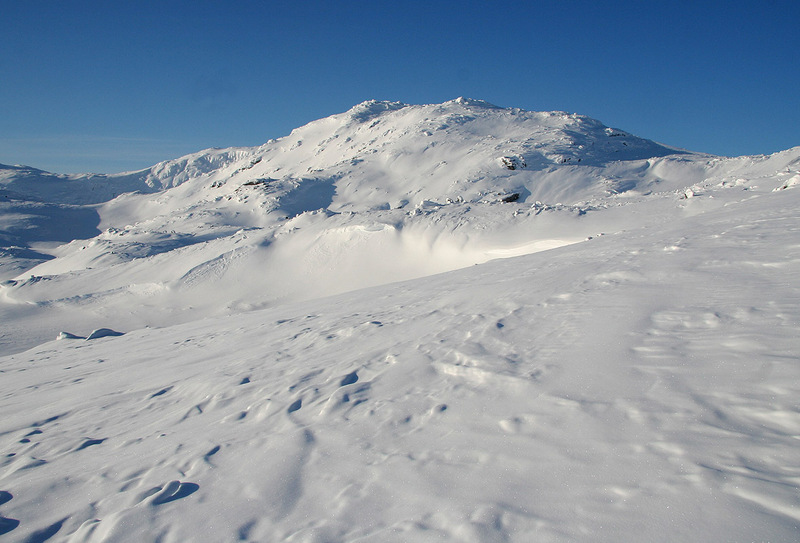 From the 1600 level saddle, Berdalseken has a very nice and smooth slope (great skiing) climbing to its main, east ridge. 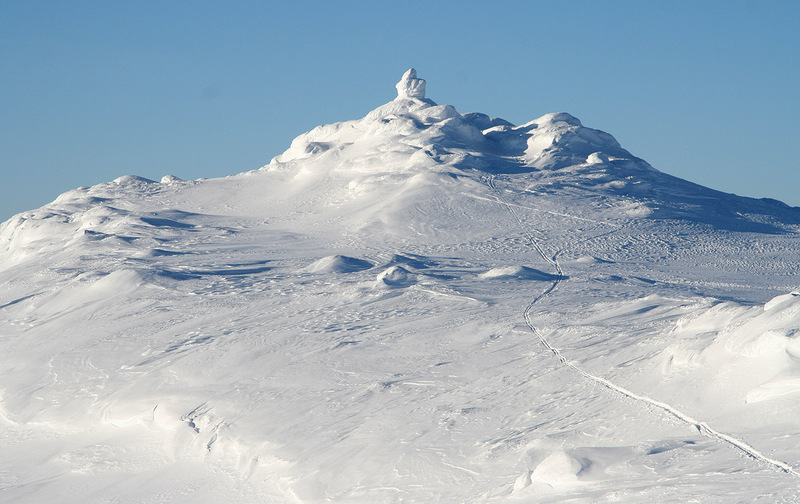 Follow this broad ridge across a small, false summit, then the summit with its impressive cairn is right ahead. Comments: Driving up from Vestre Slidre, I had planned to stay at Nystuen. The place was open and had a big sign inviting guests for dinner and overnight stays. However, nobody seemed to be home. We (there were several more potential guest) rang the bell at the reception repeatedly, no sign of life. After about 10 minutes, I gave up and returned to the hotel at Tyinkrysset. At dinner I met three nice guys that enjoyed a weekend of off-piste skiing at the local downhill area. 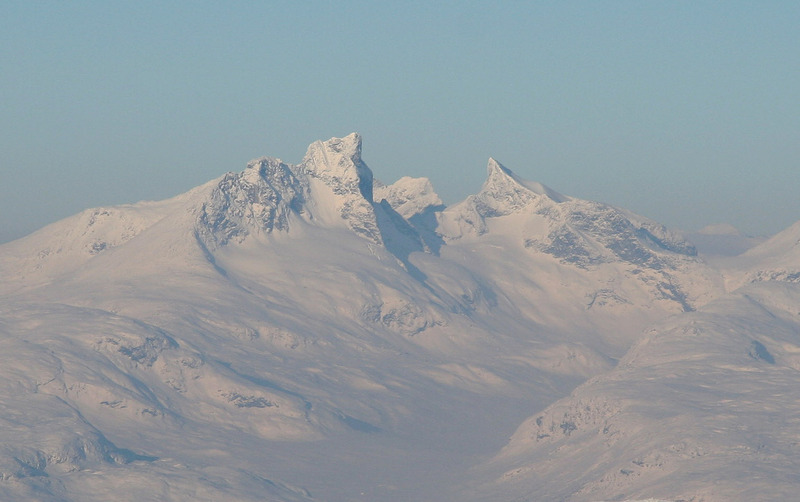 Two from Tønsberg, one from Hønefoss, they collected Norwegian 2000 meter summits as well, but admitted that any summit that had a good skirun down was indeed attractive. Breakfast at 0900, no hurry - it was more than a bit cold. I wondered if it would get any warmer a bit later in the day. I drove the short distance to the trailhead about 0930. The parking was about 100 meter further down the road. The temperature showed minus 25 Celcius - brrrr! I had put on 4 layers on my top body, only Devold plus my mountain pants below. A double pair of mittens, both wool as there was little wind. There must have been almost no wind recently, the snow was deep, often knee-deep. I broke trail all the way to the summit. No crust, part of the way I only sank in about to the top of my ski boot, but very soft and deep snow was present in patches even quite high on the mountain. I left the car 0945 and arrived at the summit precisely 3 hours later. It had been an exceptionally fine trip. I managed to stay warm and the scenery was close to perfect. 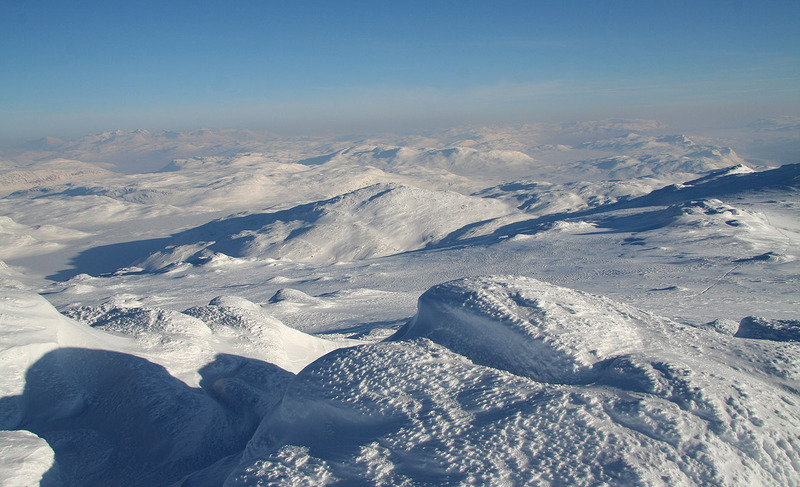 It is quite special to reach the high ridge and look north, Hurrungane and Jotunheimen laid out like a huge mosaic. It was really too cold to make any stops or to take many pictures. A moment without a mitten and I immediately felt the cold. Still, I was pretty warm when arriving at the summit cairn and managed to take a few pictures of the nice scenery that I could see all around. I left the summit at 1310 and got a double bonus, a track to ski in and mainly downhill slopes. Thus, I was back at the car in just over one hour, at 1415. 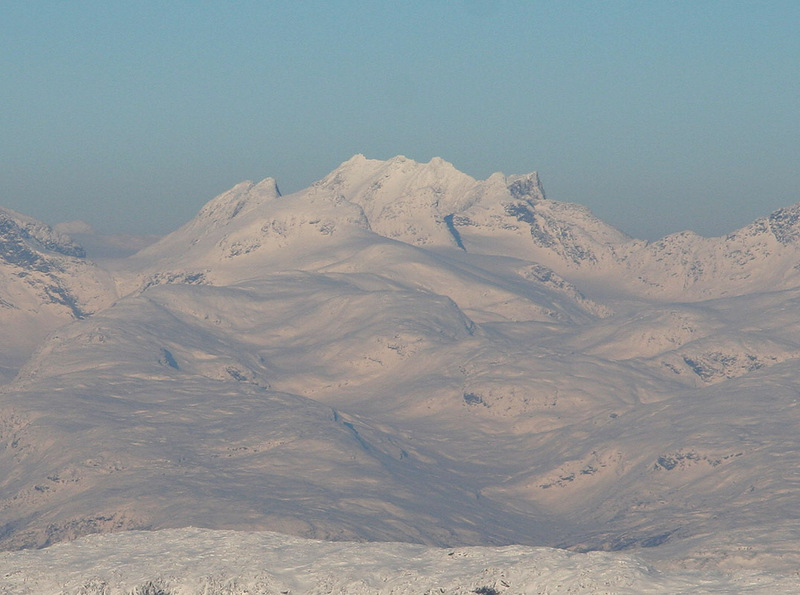 It felt a lot warmer than higher up, but the temperature was still a cold minus 21 Celcius. 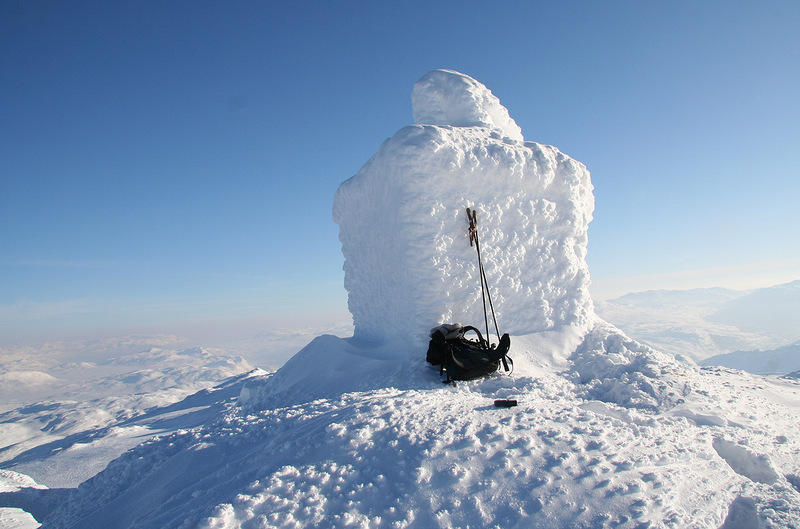 I wonder how cold it was at the summit, most likely below minus 30. I spoke briefly with a man that had been to his cabin located just across the bridge. He was highly surprised when I told him that I had been to Berdalseken, he said they did not attempt it before Easter time. The drive back to Bergen went smoothly, quite many cars from Voss and I was home by 1800. 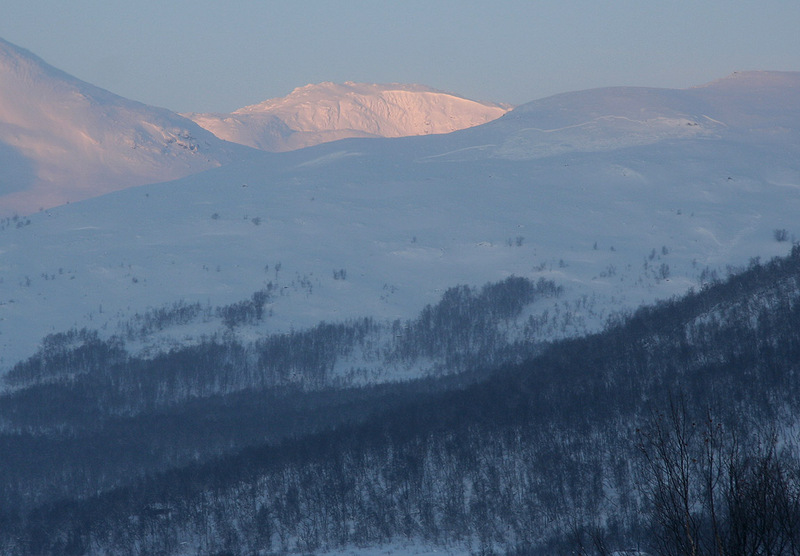 Morning view, from E-16, towards Berdalseken. The Trailhead, observe the bridge, the car park (further right) and the first part of my ski track. 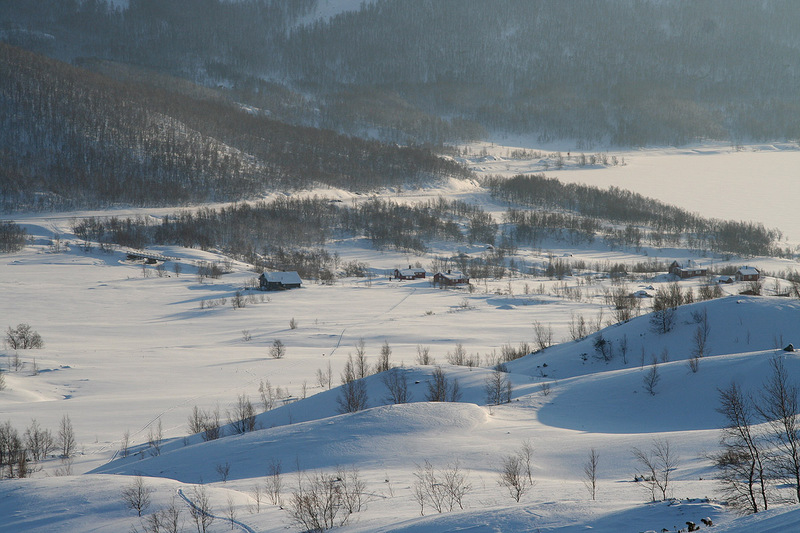 Øvre Smeddalsvatnet, 931 m, and the broad Filefjell Hwy. crossing going east. 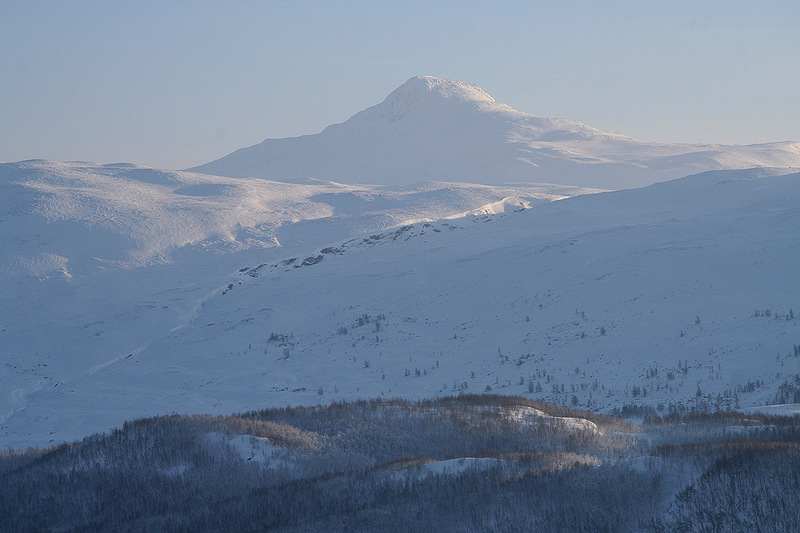 Suletinden, 1780m, is right across from vetleFrostdalen. A view back, from the saddle north of point 1495. Austabottind og Ringstind, a very impressive view. 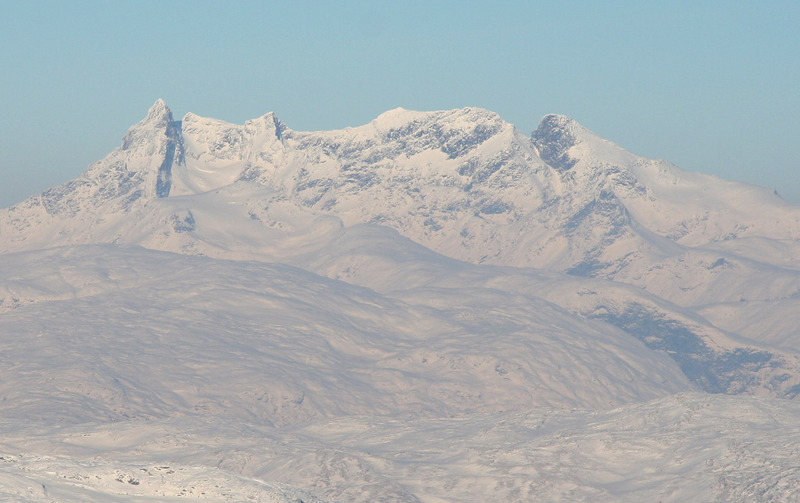 Dyrehaugsryggen, and the summits nearby. 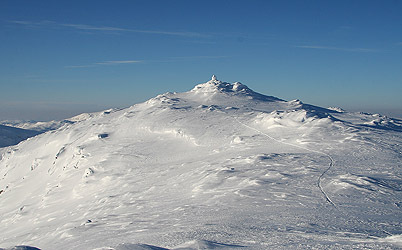 Styggedalsryggen, from Storen to Gjertvasstind.